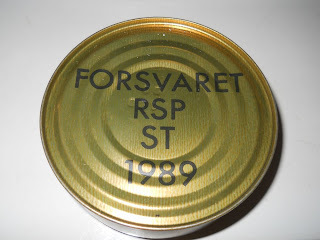 As the Norwegian saying goes; a beloved child have many names... Dead man in a can. Remains of blown up personnel. Recirculated personnel. I am off course talking about ReserveStridsProviant - Emergency Combat Rations. 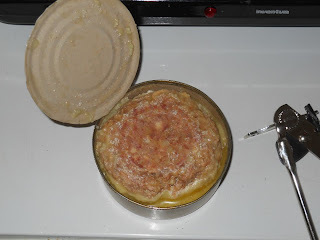 Old style military cuisine; hermetically canned, irradiated (because radiation is good for you!) and piled high in military storehouses... until they started phasing them out at roughly the same time I joined the Air Force (ie: a long time ago). Luckily I managed to get my dirty little hands at a couple of crates when they sold them off, and I still had one crate left when I deployed to Sudan. So when I got back down here after my last leave, I slipped a few cans in my luggage... because there is no finer cuisine in the field. Well. There is no simpler way to get a decent mix of beef, pork, lard and peas. According to what I was told in boot camp, the peas is added to recipe to give you some fiber to help keep everything inside your guts... it can be pretty greasy stuff, even more so if you're forced to eat it cold. 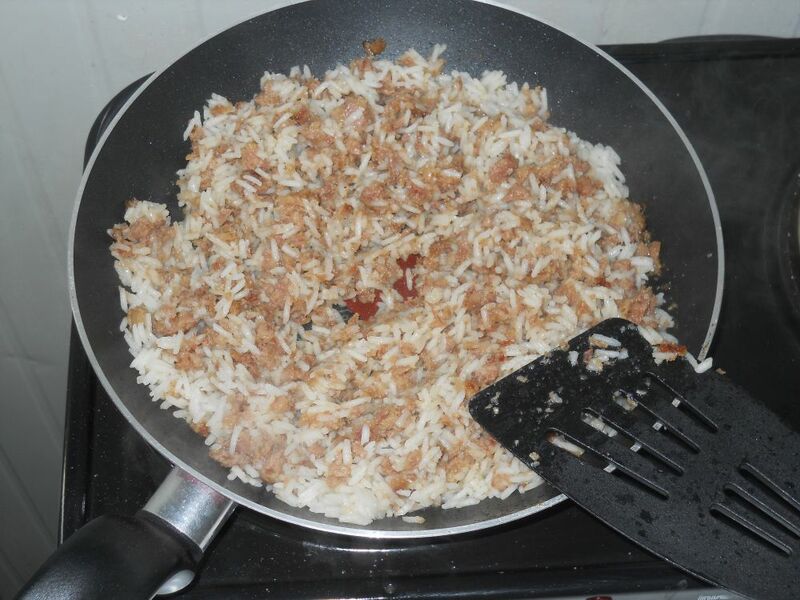 Mixed with rice, maybe some fried onion, or anything you want it makes a quite decent lunch or dinner - just don't plan on eating too much the rest of the day; it has more calories than you care to know about. The basic idea was that one portion should not only keep you on your feet all day, but keep you marching and fighting for that day. Simple, utilitarian packaging... one tin can, stamped on the lid with all you need to know: Armed Forces, Emergency Combat Ration, Manufacturer Code, year of manufacture... why yes, this lovely dinner in making is 21 years old. And your point was? I did forgo the traditional can opener (similar to the P-38 can opener) since I've never managed to open a can with that style opener. In the interest of not making a huge mess, I also did forgo the other traditional way to open these cans: using a bayonet or a sami knife. 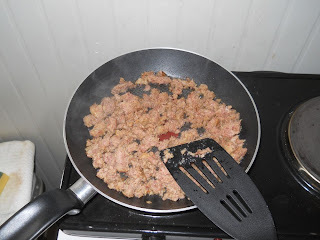 Just dump in a hot pan - the lard it contains means you don't have to worry about putting butter or oil in the pan first. Fry while stirring, until it gets warm throughout and turns a darker colour. If you like you can add some spices at this point, salt and pepper being the traditional choice - since that was you you got in the ration packs back in ye olden days. 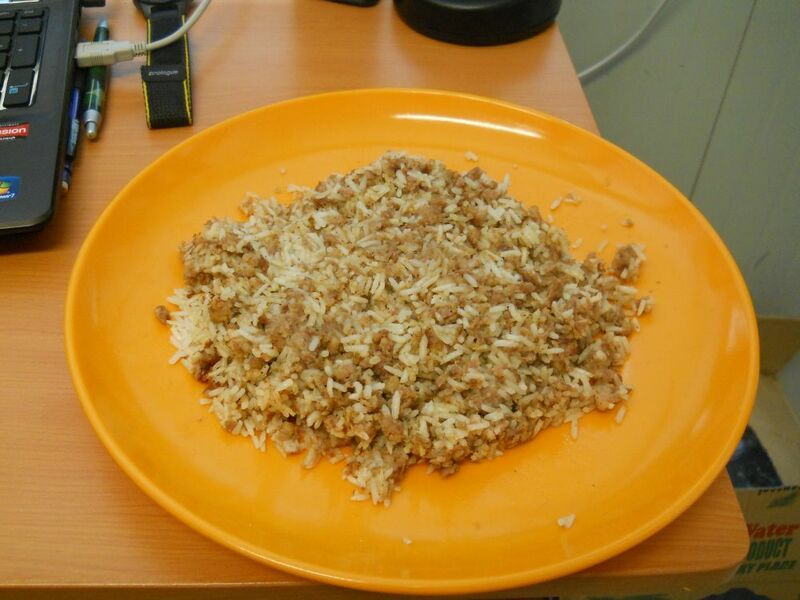 To bulk it out and add more fiber, I had boiled up a deciliter (uhm.. about 2/5 of a cup for my non-metric readers) of rice and added that to the meat... allowing it to simmer for a few minutes so the rice could soak up the flavours and reheat. Mmmhm... yummy dinner. Off course, it should be properly enjoyed while being cold to the bones, sitting in a waterlogged foxhole and just waiting for the instructors to toss a tear gas grenade your way... but it's pretty durn good while warm, dry and sitting in a reasonable comfortable chair too. - Trondhjems Turistproviant, which differs mainly in having less lard and have added onion and spices. - Snurring, which again have less lard and have added rice, onion and spices. Of those two, the first is the better option since it is closer to the RSP. And I said they would be easier to get hold off... not that they would be easy to find.